So, Hack Day 2007 - the plea went out on my blog for a laptop, and Talk Toshiba answered! 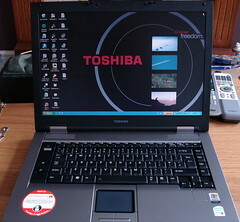 They offered me a Toshiba Tecra A8 laptop for use for Hack Day, and I gladly accepted. It arrived within a couple of days of sending off the paperwork, a few weeks before I was due to attend so I could get it setup ready for Hack Day. So far so good! On first impressions I liked the Tecra, it had a good wide screen display, and was fairly light and slim-line. It didn't come with a laptop case, which was a shame, but no great hardship. Booting it up was quick, and I was in, my first proper laptop experience awaited. I'll be honest, I'm a desktop man, I've always had a desktop, and have got very used to a keyboard and mouse set-up. Laptops I've always found a bit tricky. Starting to use this I came up against my usual issues, like learning to type again, and getting used to a touch pad. One thing I've found a little odd with the Tecra is the slightly offset keyboard layout (see pic below). It means resting your hands on the edges of the laptop doesn't guarantee the correct typing position on the left-hand side. Setting up the wireless proved easy, the Tecra seems to have a good wireless connection, and I've suffered no problems with it. 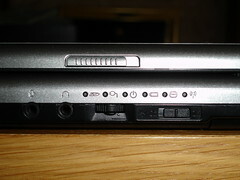 And hardware wise this laptop seems stacked! I can't say I follow laptop specs religiously, but a 2Ghz Intel Core Duo (whatever that is), 1GB Ram and 100GB HDD will do nicely for me, it is nearly the same spec as my desktop machine! It certainly hasn't under performed for me, but granted I've not really put it under much load other than some hard typing and serious web browsing. Battery life seems good, I've not suffered it running out, although I have always had the power supply to hand. It has had all the connections I've needed as well. It is also very quiet, with hardly a peep out of the fan. The downside to that is it can get quite warm on your lap after a bit of use. The only other niggle with it was the volume control, which located on the front edge, I kept flicking with my jeans (see pic). But it really is a minor niggle. So software all loaded on, and having used it for a few evenings to get used to it, it was off to Hack Day for its ultimate test. During Hack Day it performed as it had been doing, really well. I've really got used to typing on it, so much so this review is being typed up on it. However I've still not got used to the touch pad, I found I ended up with sore finger after a few hours use. It just felt a bit rough and wasn't always as sensitive as I'd have liked. I think if I owned a Tecra I'd be after a mouse to use with it. Also, after a few hours typing on it I found my hands were getting sweaty, but that is probably just me and the temperature in Alexandra Palace! So, in conclusion I really like the Tecra. It is a very well spec'd machine, and it shows in it's performance. There are some niggles with the keyboard layout and volume control, but these really are minor. To be honest having this laptop has in no small way changed my life. I've really found it easy to leave my desktop machine turned off and simply use the Tecra, sat in the lounge, with Dawn, which has pleased her no end! After this short period I'm seriously considering buying a laptop to become my main computer, the space saving factor alone is a major plus point, not to mention the portability. Well done Toshiba, you've turned me! 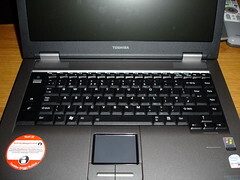 Permanent link for "Review of the Toshiba Tecra A8"
I have a Toshiba laptop. It's not as new as yours but it is really good. I too would recommend them. The downside to that is it can get quite warm on your lap after a bit of use. So, in conclusion I really like the Tecra. It is a very well spec'd machine, and it shows in it's performance. It's a shame the Tecra didn't teach you how to use apostrophes properly. You've got three occurrences of "it is" in this post (which you've probably changed from "it's" in case you got it wrong, even though being able to do that means it would definitely be correct) and then you've gone and used "it's" incorrectly again. I use mine sat on a table mat to stop the heat affecting my knees. I would have told you that lap tops were good if you had asked me!